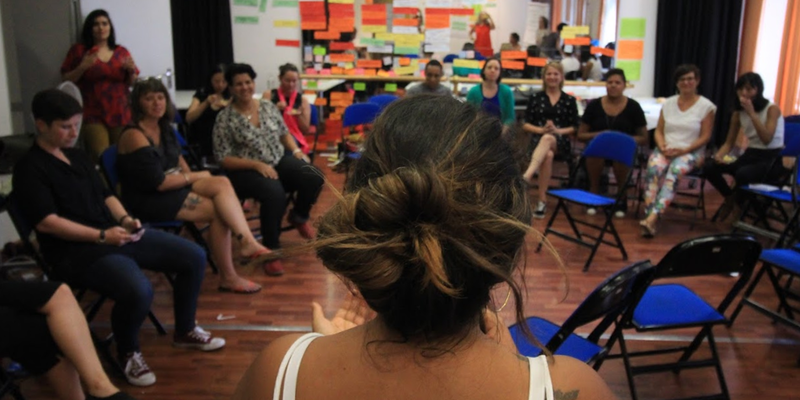 At AWID, we spend a lot of time thinking about power, and how it functions not only in the world at large but also internally within our own organization. It is this commitment to building collective power that inspired us to begin experimenting with a practice of sharing leadership. No one person can possibly ‘lead’ an organization in the traditional sense any longer - if they ever could. From investigating new models in development by others to opening space for our own staff to participate in our co-Executive Director recruitment process through a virtual town hall, as well as inviting them to share their experience and vision of shared leadership, we have been experimenting with different forms of ‘participatory leadership’ since 2010. We have seen that this approach supports staff to better contribute their talents in the organization, and make better decisions. It may always be a practice-in-process, but we know very clearly that optimal feminist leadership is not just about a single role or a person. Instead, we see it as a social process. Team leaders and members co-create that leadership, whether they hold formal ‘accountability roles’ (like a co-executive director or manager), run projects, represent AWID in important spaces, take initiative to solve problems, invent new processes or challenge existing ones that don’t work. Our current reorganization is structured around project teams. This structure and way of working take ongoing discussion and agreements, and continuous attention to decision-making processes and power. At present, there are several ways that we see shared leadership working at AWID. These range from a variety of staff members representing AWID in public spaces and places, to those without official ‘management roles’ leading projects. It includes team members soliciting support and agreement to initiate new activities or respond to important opportunities, as well as calling out and solving problems and unhelpful processes. These new practices sit alongside and in conversation with the traditional non-profit way of holding a formal accountability role, like the co-executive directors, directors and managers. What have we learned along the way? The explicit commitment that we have had from our Board, as well as willingness and support to facilitate risk and initiative-taking at all levels of staff has been crucial to this journey, as well as commitment from senior and longer-term staff to experiment and be transparent about who holds what accountability and which decisions. Together we have been able to develop a deep commitment to supporting participatory processes and balancing individual and collective voices throughout the organization. 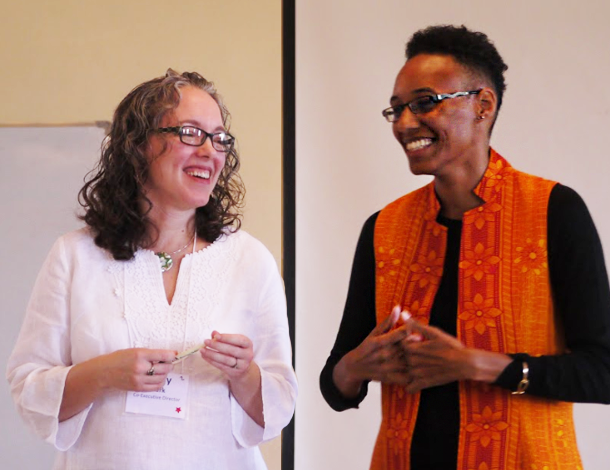 With this support, in 2017, AWID embarked on an important new co-executive director journey. At the same time, we renewed our energies toward creating opportunities for ‘the whole’ organization to lead and learn together - not just co-leadership at the top. It does take time, and certainly at the beginning, and is not always the fastest way to work. But committing at the outset to making time to do things differently is key, as is reflection by managers and staff on the power they hold to ensure effective engagement, and enable more shared decision-making. Clear decision-making processes along the way are also vital, and should be reviewed and made more explicit as we go along, so that we are always clarifying and sorting out who gets to decide what, when. Finally, a collective willingness to reflect, learn from mistakes and try again helps us figure things out, especially when trust is broken, and needs to be restored. In an AWID staff survey conducted in April 2017, 70% of respondents indicated that they had already experienced shared leadership and had positive experiences with it. 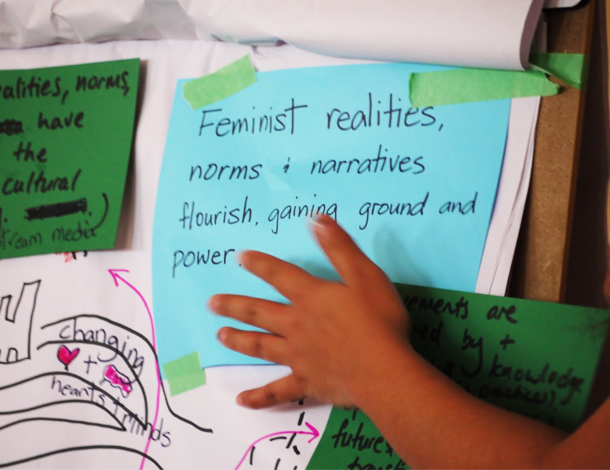 Our shared leadership process recognizes the challenges and complexities of leadership roles and the ways in which AWID is positioned to support feminist movements within our changing political contexts. It is allowing more leadership to flourish through project management teams, though we need to continuously ensure clarity about decision-making, roles and responsibilities. But for the process and practice to continue to grow, we need to continue to find more opportunities to experiment and provide ongoing support for learning. We know that there are many inspiring groups and organizations who have been and are increasingly exploring new ways of sharing leadership. We would love to hear more about these explorations. We know that this approach is entirely consistent with a feminist politic as well as with contemporary critical management theory, but we need to continue to document how it actually works with different kinds of staff, boards and strategic plans. How does this way of working help a feminist organization and its staff grow, and in what ways does it contribute to achieving our organizational outcomes? We are really excited about the learnings that lie ahead! Does your organization practice shared leadership? We want to hear your experiences with it!